15th Annual New Mexico Infrastructure Finance Conference "Infrastructure 2010: Building Toward Sustainability"
The, New Mexico Energy, Minerals and Natural Resources Department (EMNRD), Forestry Division (Division) is seeking applications from Cooperative Weed Management Areas (CWMAs) for noxious weed management in areas where noxious weed invasions threaten forested acres. EMNRD has approximately $234,000 currently available for this project, with the possibility of additional funds being provided later, and may award multiple contracts as a result of this request for proposals (RFP). The purpose of the 3rd biennial research conference is to bring tamarisk, Russian olive and other riparian related invasive plant and restoration researchers together at a single venue to share their results with other scientists and western land managers so that future management efforts can be guided by state-of-the-science. This conference will promote dialogue between researchers and land managers to identify future research needs for the development of effective policy and management decisions. Exchange ideas, share expertise, and learn the latest technology and research during workshops and sessions. Then attend the Forest Management Expo and Career Fair. 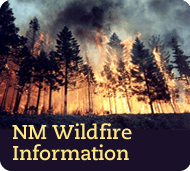 The New Mexico Energy, Minerals and Natural Resources Department (EMNRD), Forestry Division (Division) is requesting proposals for the planning and implementation of hazardous fuels mitigation projects that will reduce the fire threat in Wildland Urban Interface (WUI) areas in New Mexico. Funding will be awarded through a competitive process administered by the Western Wildland Fire Protection Committee (WWFPC), with emphasis on hazardous fuel reduction, information and education and community and homeowner action. The Division plans to award multiple contracts as a result of this Request for Proposals (RFP). Questions regarding this RFP should be addressed to: Donald Griego, State Fire Manager, EMNRD, Forestry Division, P.O. Box 1948, Santa Fe, N.M., 87504, Telephone: (505) 476-3349. Physical Address: EMNRD, Forestry Division, Wendell Chino Building, 1220 S. St. Francis Drive, Santa Fe, NM 87505. Offerors must use the 2011 Western States Wildland Urban Interface Grant application form (EXHIBIT C) to submit their proposals. Offerors may download this form from EMNRD’s Forestry Division web site: www.nmforestry.com. During our three-day conference, we will hgear from a variety of "carbon pioneers". Topics include practices that enrich soil carbon, strategies for monitoring carbon accrual, the role of grassfed food, watershed restoration, and global case studies. The New Mexico State Land Office offers an environmental education program called "Know Your Watershed" for 2nd, 4th & 6th grade classes throught out the state. The deadline for abstracts forthe 2010 New Mexico Water Research Symposium­­­: Resource Interdependence has been extended to July 6, 2010 at noon. A two day river restoration workshop on the Santa Fe River on October 17-18, 2009. Craig Sponholtz of Dryland Solutions will be leading the workshop which is sponsored by the Santa Fe Watershed Association. The workshop is free by advanced registration is required. To report research results on hydrology of traditional acequia irrigation systems. Presentations will address both technical and socio-cultural aspects of acequias along the Rio Grande. The conference will include overviews, technical sessions, and an interactive panel discussion. Mark your calendars for the 8th Annual Conference - November 4, 5, 6, 2009 in Albuquerque, New Mexico at the Embassy Suites.